Maggie Daley Field House — Valerio Dewalt Train Associates, Inc. 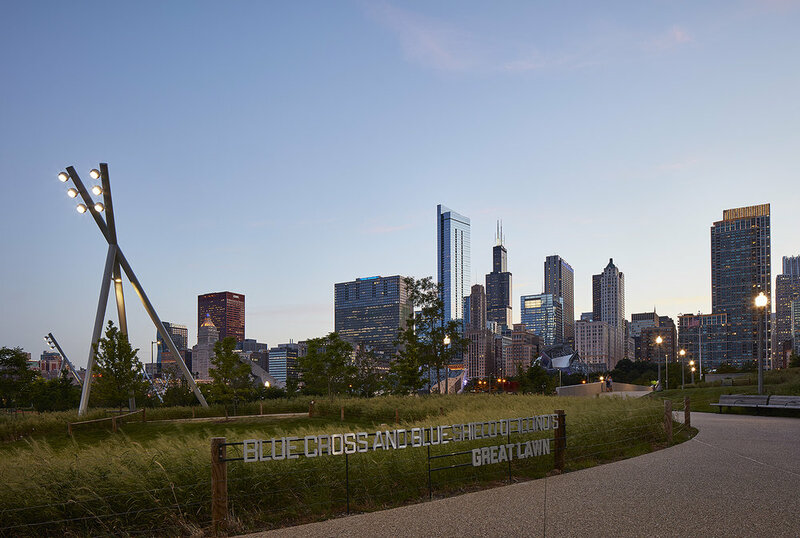 Recent renovations dramatically transformed an aging Maggie Daley Park into a destination for tourists and a growing residential community in Downtown Chicago. The new park, designed by Landscape Architect Michael Van Valkenburgh Associates, features an ice skating trail, a children’s playground, and rock-climbing wall. The Maggie Daley Field House renovation, a collaboration between Valerio Dewalt Train and Searl Lamaster Howe, matches the park’s new dynamic look and feel. An angular, perforated metal canopy, influenced by the shapes of the nearby rock climbing wall, creates an iconic entry that glows in the evening. Inside, lighting is playfully arranged above new flooring and wood seating space. The topography of the park is carved into a wood feature wall backdrop to feature donor names. The Field House provides park patrons with flexible gathering space, an education center and concession stand.